Here’s a delicious dinner that I learned from Noreen of Noreen’s Kitchen. It’s inexpensive and really quick and easy. It’ll only take about forty minutes, although it’ll taste like it was slow cooked all day long. I had tried it and it’s become one of my families favorites. View her video here. Into your 6-quart or larger Pressure Cooker, pour in the Can of Mushrooms, with the juice. Next, add the three cans of concentrated Campbells Golden Mushroom Soup to the pot, plus about a cans worth of water. Add about a pound of Baby Carrots (or any carrots) to the pot. Stir the pot to mix the ingredients. Take your pieces of Pork Chops and push them into the pot. Set the pressure cooker to High, and set the Timer to 35 minutes. Boil some Egg Noodles. Butter and salt to taste, and have ready when the cooker is done. 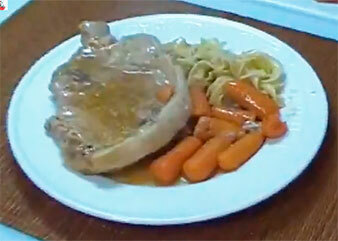 Add Egg Noodles to plate, add Carrots and Pork Chops and top with Gravy. 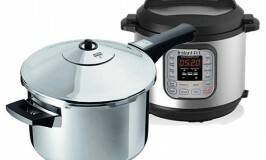 Visit our posts page for great articles on Pressure Cooking.